This post has been a LONG time coming (though, I admit, there are cards from other folks that I have yet to post which pre-date these - in due time, I assure you!). Some time ago, I received a package from the Biggs-Campbell Estate (aka Maddings and Erin Rose). 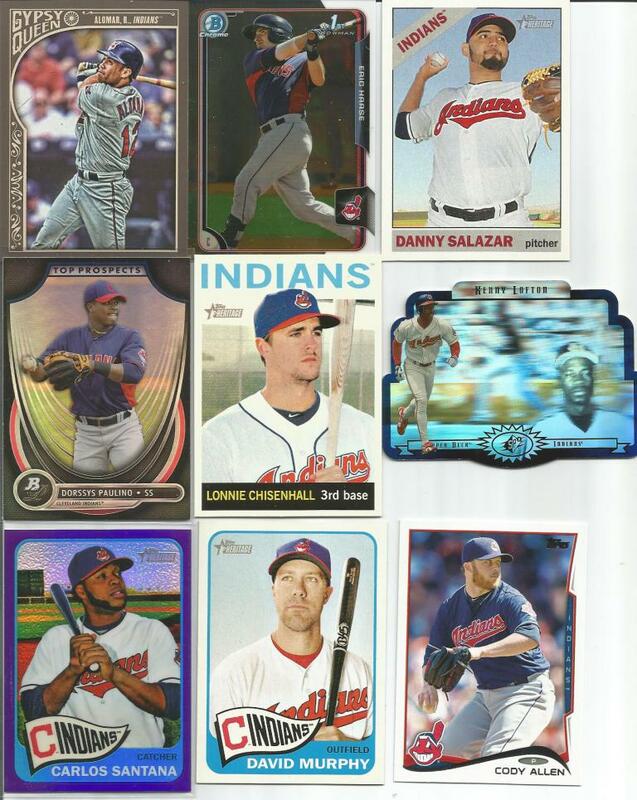 In it are some of the coolest Indians cards I have ever seen! These are in no particular order, but generally should be in the order they arrived. Mostly. 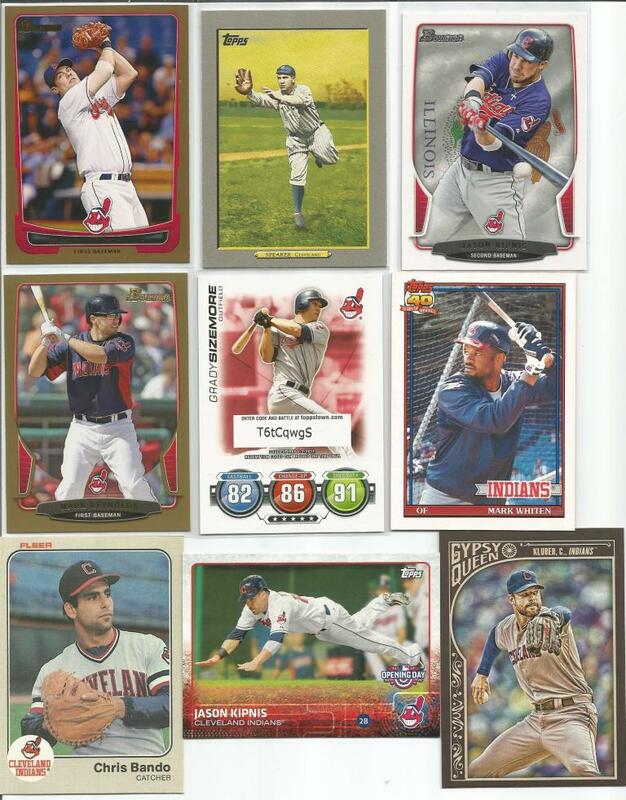 In the next group of cards, we find a Bowman Gold Casey Kotchman, 2009 Turkey Red Tris Speaker, 2013 Bowman State & Hometown Jason Kipnis, Bowman Gold Mark Reynolds, 2010 Topps Attax Grady Sizemore, and 1991 Topps Mark Whiten Tiffany. We're still not done here! 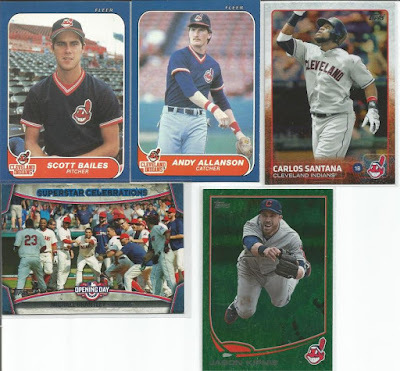 We have a 1983 Fleer Chris Bando, 2015 Opening Day Kipnis and a 2015 Gypsy Queen Corey Kluber! The next scan starts with another Gypsy Queen, but this time we have Roberto Alomar! That is followed by Bowman Chrome Eric Haase, Topps Heritage Danny Slazar, Bowman Platinum Dorssys Paulino, Heritage Lonnie Chisenhall, and Spx die cut Kenny Lofton! As if that shininess weren't enough, how about a purple shiny Carlos Santana!? 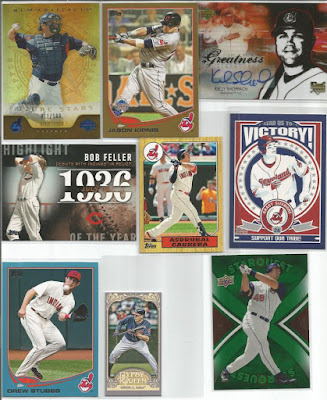 Rounding things out, we have a Heritage David Murphy and a 2014 Cody Allen. We keep going in 2014 with Kyle Crockett. That leads to a VERY cool metal card of Roberto Alomar. I know the 90's had some seriously junky wax, but sometimes, companies surprised us. That mull metal Alomar is such a bit of greatness. That is followed by two blue chrome cards: a Bowman Brian Wright (114/699) and a Topps Ricky Gutierrez (593/699). I miss the days of food tie-ins and the 92 Jimmy Dean Lofton helps bring back the memories of those oddball card days. We finish out this group with a Bowman Chrome Joe Wendle, a Bowman Top 100 Clint Frazier, a 2003 Donruss Champions Luis Garcia (pictured in Cardinals uni, traded to Tribe on 7/19/02), and finally a 1986-style Tiffany of Carlos Santana. I know you think we're almost done, but you'd be slightly mistaken. We still have plenty of cards to go! How about a gold Bowman Victor Martinez ? Or a Bowman Chrome Grady Sizemore? Or perhaps a red sparkle 2014 Zach McAllister is more your style. Whatever kind of card you like, you are sure to find it (or something danged close) in the photos of these great cards sent to me! 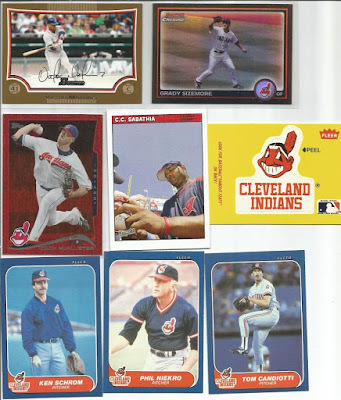 Let's keep rolling with a Bazooka Sabathia, a Fleer Indians logo sticker, and several 1986 Fleer Updates: Ken Schrom, Phil Niekro, and Tom Candiotti. 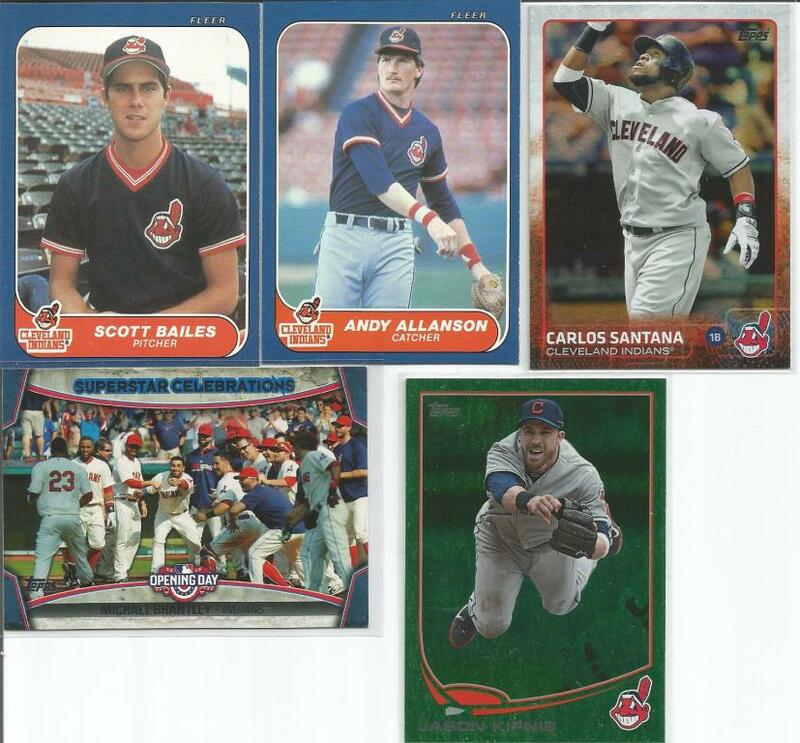 You thought we were finished with the Fleer Update? Nah! We still have Scott Bailes and Andy Allanson in the mix. That's followed by a 2015 Santana Foil, an Opening Day Indians Celebration, and we finish out the package with a green sparkle 2013 Jason Kipnis . 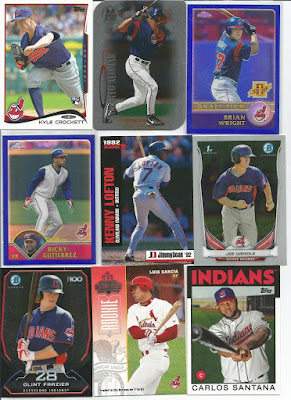 THANK YOU to Kerry and Erin for these awesome Indians cards! I cannot wait to get a bunch of these into my personal collection! 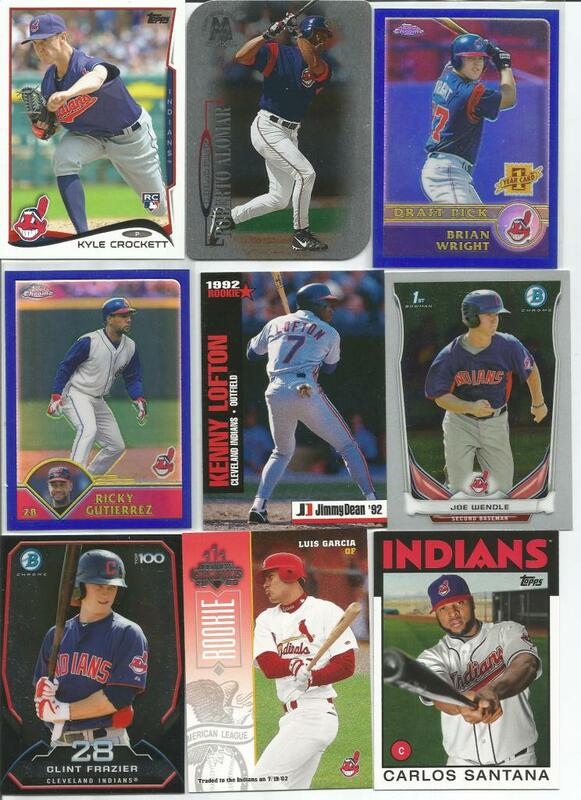 Wow, being a Tribe collector myself, I'm very jealous of some of these cards. Starting with that first Garko, which I have never seen before, to that very cool Shoppach auto, and then the Robbie metal card... so cool. The one exception for me is Casey Kotchman! My least favorite Triber of all time (ok, maybe Jose Mesa)... I just can never remember Kotchman being good in an Indians uniform. Maybe it's just me, but it's always bittersweet when I pull one of his cards. Usually, I go "Yes, an Indian!" followed quickly by "oh hell, it's Kotchman." But I digress. 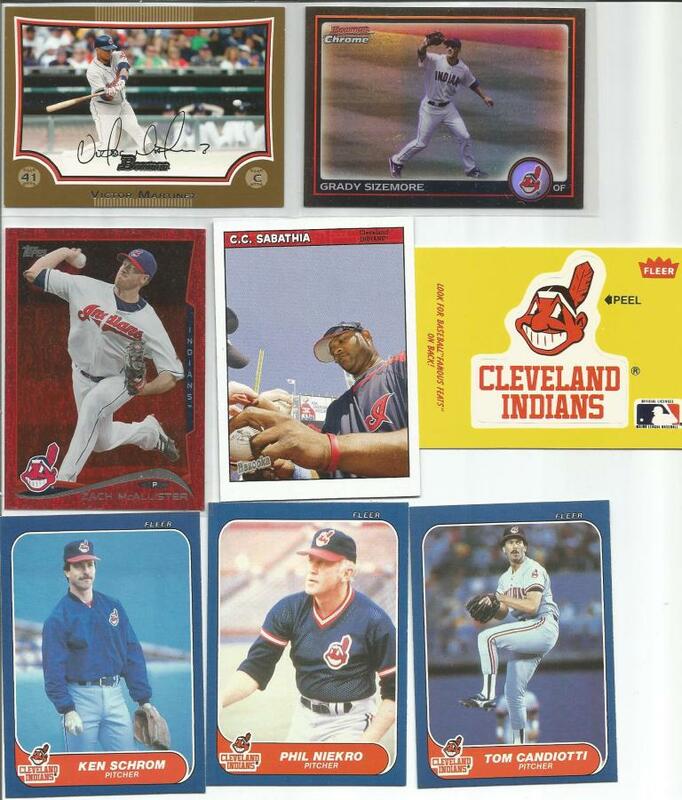 Hahaha, well, as a life-long Tribe collector, I feel that way about many Indians cards, so I totally get it!